Trisha played "Emmie Thibodeaux," daughter of the titular character in Caroline, or Change at The Studio Theatre. The Studio Theatre, located at 1501 14th St. NW on the corner of 14th and P Streets NW, is in the heart of Washington, DC. Opening on May 17, the production was extended twice before closing on July 23, 2006. Click here to open a new page full of Caroline, or Change reviews. Nomination. For more information about her nomination, please go here. 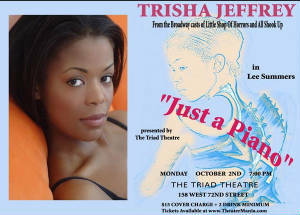 TRISHA JEFFREY IN LEE SUMMERS' "JUST A PIANO"
Trisha in her first solo show! cabaret act for one night only on Monday, October 2nd! of Horrors and Caroline, or Change, as well as "Fame,"
"Don't Rain on My Parade," "Defying Gravity" and more. A palazzo "is a big rage in Europe where they provide exquisite dining and entertainment." It reminds Trisha of "dinner theatre and a circus all in one." Trisha performed as the featured singer in the show, singing about six numbers a night. She performed alongside a variety of talents, ranging from comedians to trapeze artists! On Halloween 2006, she flew all the way to Stuttgart, Germany. 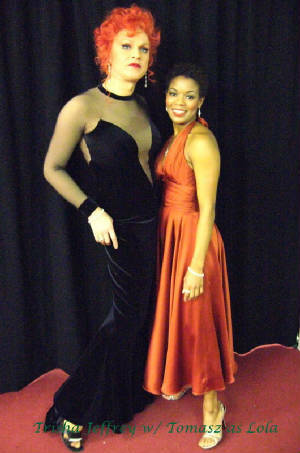 She then performed in the show beginning in early November 2006 until early February 2007. To view pictures of Trisha in the Palazzo, click here and a new page of the web site will open.